Do you have an upcoming corporate event and want to do something different? You may not be aware that Bengtson’s Pumpkin Fest holds corporate events on a regular basis during our season. Why would our pumpkin patch near Chicago be the perfect place for your next corporate event? With so many different available activities, Bengtson’s Pumpkin Fest is perfect for the entire family. Your little ones will love our rides and petting zoo, featuring baby cows, goats, pigs and more. If your kids are a little older, they could spook themselves in the Haunted Barn. No matter what age your family members, you’ll all enjoy the pig races, which are sure to make you laugh with delight. We have a variety of different rides for the enjoyment of both children and adults. Do you want to take your sliding skills to the next level? Try our 90” Mega Fun Slide, which isn’t for the faint of heart. This giant slide includes six lanes so you won’t have to wait forever in line. If you’ve ever visited Disney World, you most likely enjoyed riding in the teacups. At Bengtson’s Pumpkin Fest, we have a similar ride, the Twirling Honey Pots. Instead of spinning in teacups, you are spinning in honeypots, which is loads of fun. If you love a good swingset, wait till you experience the Happy Swing, which takes swinging to the next level! When swinging in this ride, you will feel pure bliss. Even your littlest ones can enjoy the Flying Frog Ride, where you strap yourself into one of our giant frogs and bounce your heart out. To fully appreciate the ride, we recommend keeping your arms up while you bounce away. If trains are a source of fascination for you or your kids, you will enjoy our train rides, The Hootenanny Railroad and the Clickety Clack Railroad. 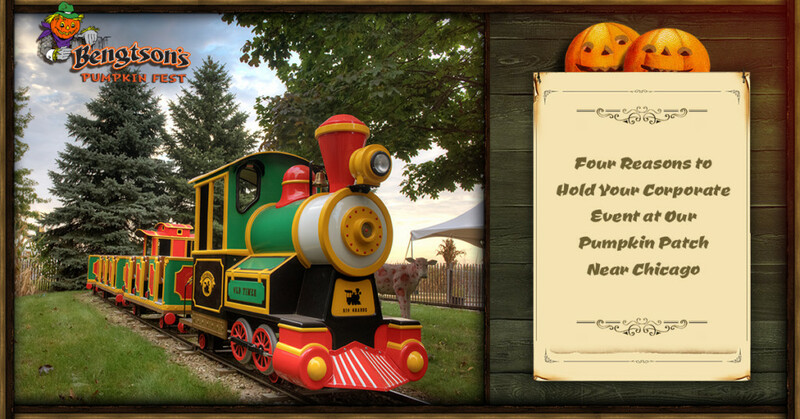 Kids love riding the trains, which traverse the Pumpkin Junction. For a more laid-back experience, nosh on some candy corn while riding the Hootenanny Railroad. Last but not least, the Frog Hopper rises high above the farm and then suddenly bounces you down. Perfect for any adrenaline junkies in the family, this ride is a blast. At Bengtson’s Pumpkin Fest, we can accommodate groups as small as 50 people and as large as 5000 people. Whether you work in a large or small company, you’ll have the best outing ever. At our pumpkin patch, we include a wide variety of different foods to suit your culinary tastes. Some of our customer favorites include our “Home Run Inn” pizza, caramel apples, funnel cakes, roasted sweet corn, hot dogs, chili, kettle corn, cotton candy and more. If you’re craving a delicious fall beverage, try one of our hot apple ciders with cinnamon sticks for a sweet treat. We even feature a BBQ joint, a Mexican restaurant and a food truck. If you want to make a reservation for your next corporate event, reserve your spot early at our pumpkin patch near Chicago. Our pumpkin patch farm would love to see you. Contact Bengtson’s Pumpkin Fest today.